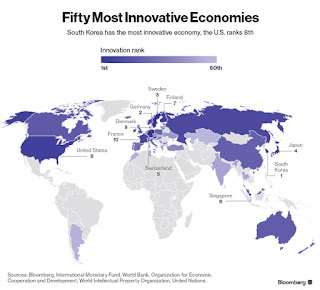 As reported by BloombergBusiness in reporting the results of its 2016 innovation index, "Korea dominates the index." The website article starts by declaring that "In the world of ideas, South Korea is king." Many in Korea, including both Koreans and expats knowledgeable about the nation's economy might differ with that assessment. However, as with any index, this one for innovation depends upon what is measured and how. The Bloomberg article goes on to note that "South Korea notched top scores worldwide for manufacturing value-added as well as for tertiary efficiency — a measure that includes enrollment in higher education and the concentration of science and engineering graduates. While the country's No. 39 ranking for productivity might pass for mediocre, it was second for R&D intensity, high-tech density and patent activity and ranked sixth for researcher concentration." The accompanying graphic (click for a full size version) shows at a glance how Korea compares with other countries in the top ten on the 2016 Bloomberg index..